MR-Monkey Man 5 months ago. Android Oreo 8.0 ROM, LineageOS 15 for Galaxy J5 has now arrived via an UNOFFICIAL build. 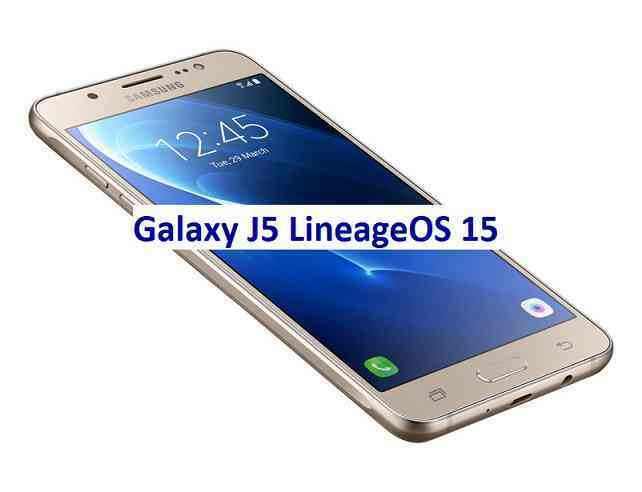 This LineageOS 15 supports the following Galaxy J5 variants: J500FN, J500F/G/M/Y. This LineageOS 15 for Galaxy J5 (j5lte) is brought to you by developer Dyneteve. – No donation link found for Dyneteve. THIS IS A BETA ROM AND MAY HAVE MANY BUGS. HAVE A BACKUP BEFORE FLASHING THIS LINEAGEOS ROM AND TRY AT YOUR OWN RISK. Installing a custom ROM on a Galaxy J5 (j5lte) requires the bootloader to be unlocked on the Galaxy J5 (j5lte) phone, which may VOID your warranty and may delete all your data. Before proceeding further you may consider backup all data on the phone. You are the only person doing changes to your phone and I cannot be held responsible for the mistakes done by you. – Here is theTWRP update guide for the Galaxy J5 (j5lte). Download and Copy the Lineage OS 15 GApps and the Android Oreo based LineageOS 15 for Galaxy J5 ROM ZIP file to your phone. First flash the Lineage OS 15 for Galaxy J5 Oreo ROM ZIP from device. Then flash the GApps for LineageOS 15 zip from your device memory. Reboot and Enjoy the Oreo 8.0 LineageOS 15 ROM for Galaxy J5. Copy the latest Galaxy J5 Lineage 15 Oreo ROM ZIP file to your phone. Stay tuned or Subscribe to the Galaxy J5 LineageOS forum For other Android Oreo, Nougat ROMs, LineageOS 15 ROMs, other ROMs and all other device specific topics. can you make lineageos 14 or 15 for samsung a8 sm-a800f ?? good first of all congratulate them for the great work they do, now try the rom oreo 15_j2 they have published for the J5lte my model is J500M and the first thing I saw at first glance and very important is that it does not signal mobile networks, I hope that can solve this problem greetings and waiting for new versions, I currently have the Android 7.1.2 and everything is perfect until now, the only thing that the camera takes a while to turn on and to focus with flash you have to turn it on and off and just like that it works the flash of this, but what you do never turn on when you focus it. I hope and I understood. can anyone please post a working Samsung Galaxy J5 link. All the links here are dead ends.